Huxley’s writings point to an implicit recognition of the capacity of entheogens to be used as educational “tools”. The concept of tool here refers not merely the physical devices fashioned to aid material production, but, following Vygotsky (1978), more broadly to those means of symbolic and/or cultural mediation between the mind and the world (Cole, 1996; Wertsch, 1991). Of course, deriving educational benefit from a tool requires much more than simply having and wielding it; one must also have an intrinsic respect for the object qua tool, a cultural system in which the tool is valued as such, and guides or teachers who are adept at using the tool to provide helpful direction. As Larsen (1976) remarks in discussing the phenomenon of would-be “shamans” in Western culture experimenting with mind-altering chemicals: “we have no symbolic vocabulary, no grounded mythological tradition to make our experiences comprehensible to us . . . no senior shamans to help ensure that our [shamanic experience of] dismemberment be followed by a rebirth” (p. 81). Given the recent history of these substances in modern Western culture, it is hardly surprising that they have been demonized (Hofmann, 1980). However, cultural practices that have traditionally used entheogens as therapeutic agents consistently incorporate protective safeguards—set, settingviii, established dosages, and mythocultural respect (Zinberg, 1984). 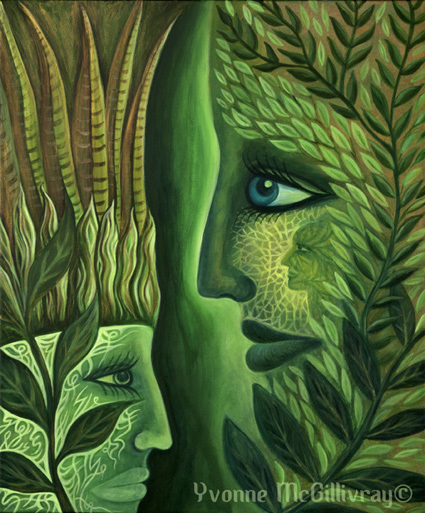 The fear that inevitably arises in modern Western culture when addressing the issue of entheogens stems, I submit, not from any properties intrinsic to the substances themselves, but rather from a general misunderstanding of their power and capacity as tools. Just as a sharp knife can be used for good or ill, depending on whether it is in the hands of a skilled surgeon or a reckless youth, so too can entheogens be used or misused. Abramson, H. A. (Ed.). (1967). The use of LSD in psychotherapy and alcoholism. New York: Bobbs-Merrill Co. Ltd.
Barker, S.A., Monti, J.A. & Christian, S.T. (1981). N,N-Dimethyltryptamine: An endogenous hallucinogen. International Review of Neurobiology. 22, 83-110. Brown, M.F. (1986). Tsewa’s gift: Magic and meaning in an Amazonian society. Washington, D.C.: Smithsonian Institution Press. Burroughs, W. S., & Ginsberg, A. (1963). The yage letters. San Francisco, CA: City Lights Books. Callaway, J.C., McKenna, D.J., Grob, C.S., Brito, G.S., Raymon, L.P., Poland, R.E., Andrade, E.N., & Mash, D.C. (1999). Pharmacokinetics of hoasca alkaloids in healthy humans. Journal of Ethnopharmacology. 65, 243-256. Cohen, S. (1964). The beyond within: The LSD story. New York: Atheneum. Cole, M. (1996). Culture in mind. Cambridge, MA: Harvard University Press. Cremin, L. A. (1961). The transformation of the school: Progressivism in American education, 1867-1957. New York: Vintage Books. Czikszentmilhalyi, M. (1996). Creativity. New York: Harper Collins. Davis, W. (2001, January 23). In Coulter, P. (Producer). The end of the wild [radio program]. Toronto: Canadian Broadcasting Corporation. Dobkin de Rios, M. (1973). 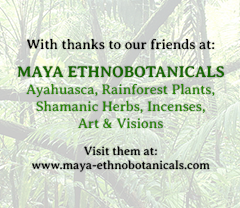 The influence of psychotropic flora and fauna on Maya religion. Current Anthropology. 15(2), 147-64. Dobkin de Rios, M. (1984). Hallucinogens: Cross-cultural perspectives. Albuquerque, NM: University of New Mexico Press. Dobkin de Rios, M. (1996). On “human pharmacology of hoasca”: A medical anthropology perspective. The Journal of Nervous and Mental Disease. 184(2), 95-98. Dobkin de Rios, M., & Janiger, O. (2003). LSD, Spirituality, and the Creative Process. Park Street Press. Doblin, R. (1991). Pahnke’s “Good Friday Experiment”: A long-term follow-up and methodological critique. The Journal of Transpersonal Psychology. 23(1): 1-28. Egan, K. (2002). Getting it wrong from the beginning: Our progressivist inheritance from Herbert Spencer, John Dewey, and Jean Piaget. New Haven, CT: Yale University Press. Eliade, M. (1964). Shamanism: Archaic techniques of ecstasy. (W.R. Trask, Trans.). New York: Pantheon Books. Eliade, M. (1978). A history of religious ideas: From the stone age to the Eleusinian mysteries (Vol. 1). Chicago, IL: University of Chicago Press. Fikes, J. C. (1996). A brief history of the Native American Church. In H. Smith & R. Snake (Eds. ), One nation under god: The triumph of the Native American church (p. 167-73). Santa Fe, NM: Clear Light Publishers. Gardner, H. (1999a). Are there additional intelligences? In J. Kane (Ed. ), Education, information, transformation: Essays on learning and thinking (p. 111-131). Upper Saddle River, NJ: Prentice-Hall. Gardner, H. (1999b). Intelligence reframed: Multiple intelligences for the 21st century. New York: Basic Books. Gotz, I.L. (1970). The psychedelic teacher: Drugs, mysticism, and schools. Philadelphia, PA: Westminster Press. Greeley, A .M. (1974). Ecstasy: A way of knowing. Englewood Cliffs, NJ: Prentice-Hall. Grinspoon, L., & Bakalar, J. B. (1998). Psychedelic drugs reconsidered. New York: The Lindesmith Center (Original work published 1979). Grob, C. S., McKenna, D. J., Callaway, J. C., Brito, G. C., Neves, E. S., Oberlander, G., Saide, O. L., Labigalini, E., Tacla, C., Miranda, C. T., Strassman, R. J., & Boone, K. B. (1996). Human psychopharmacology of hoasca, a plant hallucinogen used in ritual context in Brazil. The Journal of Nervous and Mental Disease. 184(2), 86-94. Grob, C. S. (1999). The psychology of ayahuasca. In R. Metzner (Ed. ), Ayahuasca: Hallucinogens, consciousness, and the spirit of nature (p. 214-249). New York: Thunder’s Mouth Press. Halifax, J. (1979). Shamanic voices: A survey of visionary narratives. New York: Dutton. Harman, W. W., McKim, R. H., Mogar, R. E., Fadiman, J., and Stolaroff, M. (1966). Psychedelic agents in creative problem-solving: A pilot study. Psychological Reports. 19: 211-227. Hofmann, A. (1980). LSD: My problem child. (J. Ott, Trans.). New York: McGraw-Hill. Horowitz, M., & Palmer, C. (Eds.). (1999). Moksha: Aldous Huxley’s classic writings on psychedelics and the visionary experience. Rochester, VT: Park Street Press. Huxley, A. (1946). Brave new world: A novel. New York: Harper & Row. (Original work published 1932). Huxley, A. (1962). Island. New York: Harper & Row. Huxley, A. (1971). The doors of perception & heaven and hell. Middlesex, England: Penguin Books. (Original work published 1954). Izumi, K. (1970). LSD and architectural design. In B. Aaronson & H. Osmond, (Eds. ), Psychedelics: The uses and implications of hallucinogenic drugs (p. 381-397). Garden City, NY: Anchor Books. John-Steiner, V., & Souberman, E. (1978). Afterword. In L. Vygotsky, Mind in society: The development of higher psychological processes (p. 121-133). Cambridge, MA: Harvard University Press. Julien, R.M. (1998). A primer of drug action: A concise, non-technical guide to the actions, uses, and side effects of psychoactive drugs (8th ed.). Portland, OR: W.H. Freeman & Company. Krippner, S. (1985). Psychedelic drugs and creativity. Journal of Psychoactive Drugs. 17(4): 235-245. LaBarre, W. (1989). The peyote cult (5th ed.). Hamden, CT: Shoe String Press. LaPlante, E. (1993). Seized: Temporal lobe epilepsy as a medical, historical, and artistic phenomenon. New York: Harper-Collins. Larsen, S. (1976). The shaman’s doorway: Opening the mythic imagination to contemporary consciousness. New York: Harper & Row. Lewin, L. (1997). Phantastica: A classic survey on the use and abuse of mind-altering plants. Rochester, VT: Park Street Press. (Original work published 1924). Luna, L.E. (1984). The concept of plants as teachers among four mestizo shamans of Iquitos, northeastern Peru. Journal of Ethnopharmacology. 11(2), 135-156. Masson, J. M., & McCarthy, S. (1995). When elephants weep: The emotional lives of animals. New York: Delta Books. Masters, R. E. L., & Houston, J. (1966). The varieties of psychedelic experience. New York: Holt, Rinehart and Winston. McKenna, D.J. (1999). Ayahuasca: An ethnopharmacologic history. In R. Metzner (Ed. ), Ayahuasca: Hallucinogens, consciousness, and the spirit of nature (p. 187-213). New York: Thunder’s Mouth Press. McKenna, D. J., Towers, G. H. N., & Abbot, F. (1984). Monoamine oxidase inhibitors in South American hallucinogenic plants: Tryptamine and -carboline constituents of ayahuasca. Journal of Ethnopharmacology. 10(2), 195-223. McKenna, T. (1992). Food of the gods: The search for the original tree of knowledge. New York: Bantam. Metzner, R. (1999). Introduction: Amazonian vine of visions. In R. Metzner (Ed. ), Ayahuasca: Hallucinogens, consciousness, and the spirit of nature (p. 1-45). New York: Thunder’s Mouth Press. Myerhoff, B. G. (1974). Peyote hunt: The sacred journey of the Huichol Indians. Ithaca, NY: Cornell University Press. Narby, J. (2002). Shamans and scientists. In C.S. Grob (Ed. ), Hallucinogens: A reader (p. 159-163). New York: Jeremy P. Tarcher/Putnam. Oster, G. (1970). Phosphenes. Scientific American. 222(2), 83-87. Ott, J. (1994). Ayahuasca analogues: Pangæan entheogens. Kennewick, WA: Natural Products Co.
Pahnke, W. (1970). Drugs and Mysticism. In B. Aaronson & H. Osmond, (Eds. ), Psychedelics: The uses and implications of hallucinogenic drugs (p. 145-165). Cambridge, MA: Schenkman. Pande, C. G. (1984). Foundations of Indian culture: Spiritual vision and symbolic forms in ancient India. New Delhi: Books & Books. Pert, C. (2001, May 26). The matter of emotions. Paper presented at the Remaining Human Forum, University of British Columbia, Vancouver. Reichel-Dolmatoff, G. (1975). The shaman and the jaguar: A study of narcotic drugs among the Indians of Colombia. Philadelphia, PA: Temple University Press. Riba, J., Rodriguez-Fornells, A., Urbano, G., Morte, A., Antonijoan, R., Montero, M., Callaway, J.C., & Barbanoj, M.J. (2001). Subjective effects and tolerability of the South American psychoactive beverage Ayahuasca in healthy volunteers. Psychopharmacology. 154, 85-95. Riba, J., Rodriguez-Fornells, A., Strassman, R.J., & Barbanoj, M.J. (2001). Psychometric assessment of the Hallucinogen Rating Scale in two different populations of hallucinogen users. Drug and Alcohol Dependence. 62(3): 215-223. Ruck, C., Bigwood, J., Staples, B., Ott, J., & Wasson, R. G. (1979). Entheogens. The Journal of Psychedelic Drugs. 11(1-2), 145-146. Schultes, R. E., & Hofmann, A. (1992). Plants of the gods: Their sacred, healing, and hallucinogenic powers. Rochester, VT: Healing Arts Press. Shorter Oxford English Dictionary (3rd ed.). (1973). Oxford: Oxford University Press. Smith, H. (1964). Do drugs have religious import? In D. Solomon (Ed. ), LSD: The consciousness expanding drug (p. 155-169). New York: G.P. Putnam’s Sons. Smith, H. (2000). Cleansing the doors of perception: The religious significance of entheogenic plants and chemicals. New York: Tarcher-Putnam. Smith, H., & Snake, R. (Eds.). (1996). One nation under god: The triumph of the Native American church. Santa Fe, NM: Clear Light Publishers. Spitzer, M., Thimm, M., Hermle, L., Holzmann, P., Kovar, K.A., Heimann, H., et al. (1996). Increased activation of indirect semantic associations under psilocybin. Biological Psychiatry. 39(12): 1055-1057. Stafford, P. & Golightly, B. (1967). LSD: The problem-solving psychedelic. New York: Award Books. Strassman, R. J., & Qualls, C. R. (1994). Dose-response study of N,N-dimethyltryptamine in humans. I. Neuroendocrine, autonomic and cardiovascular effects. Archives of General Psychiatry. 51(2), 85-97. Strassman, R.J., Qualls, C.R., Uhlenhuth, E.H., & Kellner, R. (1994). Dose-response study of N,N-dimethyltryptamine in humans. II. Subjective effects and preliminary results of a new rating scale. Archives of General Psychiatry. 51(2): 98-108. Tupper, K.W. (in press). Entheogens and education: Exploring the potential of psychoactives as educational tools. Journal of Drug Education and Awareness. United Nations. (1977). Convention on psychotropic substances, 1971. New York: United Nations. Vonk, J. (2003). Gorilla and orangutan understanding of first- and second-order relations. Animal Cognition. 6(2), 77-86. Vygotsky, L., (1978). Mind in society: The development of higher psychological processes (M. Cole, V. John-Steiner, S. Scribner, & E. Souberman, Eds.). Cambridge, MA: Harvard University Press. Wasson, R. G. (1968). Soma: The divine mushroom of immortality. New York: Harcourt Brace Jovanovich. Wasson, R.G. (1980). The wondrous mushroom: Mycolatry in Mesoamerica. New York: McGraw-Hill. Watts, A. (1969). This is it. Toronto, Ont. : Collier-Macmillan Canada Ltd. (Original work published 1958). Weil, A. (1986). The natural mind: A new way of looking at drugs and the higher consciousness. Boston: Houghton Mifflin. (Original work published 1972). Winkelman, M. (2000). Shamanism: The neural ecology of consciousness and healing. Westport, CT: Bergin & Garvey. Zinberg, N. E. (1984). Drug, set, and setting: The basis for controlled intoxicant use. New Haven, CT: Yale University Press. i The 1971 United Nations Convention on Psychotropic Substances allows for indigenous peoples to use traditional medicines and sacraments even if those substances are prohibited under international drug control treaties (United Nations, 1977, Article 32). ii Santo Daime is the name of the sacrament as well as the religion. iii Writers and drug aficionados William S. Burroughs and Allan Ginsberg (1963) published an account of their experiences seeking out and drinking ayahuasca in South America in the early 1960s, but their report was mostly negative and did not inspire many others to follow in their footsteps. As ethnobotanist Wade Davis remarks, “ayahuasca is many things, but pleasurable is not one of them” (2001). iv The original seven types of intelligence Gardner (1983) proposed were: linguistic, logical-mathematical, spatial, musical, kinesthetic, interpersonal, and intrapersonal. v Eliade (1964) identifies two primary ways of becoming a shaman: 1) hereditary transmission, or falling heir to the vocation in a family legacy passed down from generation to generation; and 2) spontaneous vocation, or being called to shamanism by the spirits. Prodigious existential intelligence may be manifest in either case. vi Here I conceptually separate education and schooling; unfortunately, I don’t see the latter institution—the legacy of 19th-century homogenizing and democratizing socio-political programs (Cremin, 1961; Egan, 2002)—as inspiring much optimism for an embracing of existential intelligence. vii Gotz (1970) argues that the practices of teachers might benefit from the mind-expanding potential of psychedelics. viii “Set is a person’s expectations of what a drug will do to him [sic], considered in the context of his whole personality. Setting is the environment, both physical and social, in which a drug is taken” (Weil, 1972/1986). These factors influence all psychoactive drug experiences, but psychedelics or entheogens especially so. Is this study still being conducted. I feel like If there was a way to, further these study’s with granted permission we may be able to break through. I have just been barred from an exhibition in Spain because they have com pany that cureates the show and they say that I am promoting drugs, by telling the audience that my paintings have been made under San pedro and Ayahuasca! Alann de Vuyst: You can’t be serious. Why is that? Please tell us more about this and what happened afterwards. In the Rig Vidal isn’t Soma where some Yoga’s go to in meditation, it is called, bliss, and is maybe a Kundalini Yoga experience as well? I read it’s one of the reasons Yogi’s stay in meditation for such a long time, be because of the natural Soma every human has?